In his piece, Mr. Pham “lays out recommended ways and means that Washington can regain and maintain the strategic initiative in the Indo-Pacific.” However many of his recommendations are based on false assumptions and if implemented are likely to be ineffective and counterproductive. Mr. Pham fears that “years of American acquiescence and accommodation may have eroded the international rule of law and global norms; diminished the regional trust and confidence in U.S. preeminence, presence, and constancy; weakened some of the U.S. regional alliances and partnerships; undermined Washington’s traditional role as the guarantor of the global economy and provider of regional security, stability, and leadership; and perhaps even emboldened Beijing to expand its global power and influence and accelerate the pace of its deliberate march toward regional preeminence and ultimately global preeminence.” But the rapid decline of U.S. soft power in the region is not due as much to “American acquiescence and accommodation” to China as it is to American political arrogance, cultural chauvinism, and a general lack of respect for its allies and ‘friends’ in the region and their peoples. Its hypocrisy, interference in domestic politics, and support of brutal dictators did not help. It is now beginning to experience the inevitable blowback from this attitude and behavior and its reign as regional hegemon may be coming to an end. It may well eventually be replaced by China in the region, but for Mr. Pham to assert that China will attain “global preeminence” is premature at best. Indeed, if China does not learn from the American experience, it may well repeat its mistakes and suffer a similar fate. Another of Mr. Pham’s major assumptions is that “Washington has a moral and global obligation of leadership to further encourage and challenge China to become a more responsible global stakeholder…” The U.S. is no longer the world’s moral leader – if it ever was – certainly not from the perspective of China and much of Asia – if not the world. Moreover Mr. Pham’s statement reflects the cultural arrogance that has drawn the U.S. into endless wars—and should be disregarded on that basis alone. First, the 2002 Declaration on the Conduct of the Parties in the South China Sea (DOC) does not contain such language and Mr. Pham is apparently interpreting its language for his own purposes. His interpretation is not shared by China, Vietnam, Malaysia, the Philippines, and Taiwan. All have altered the features they occupy to some degree since the agreement on the DOC. Second, according to China, President Xi Jinping agreed to no such thing. This statement repeats a biased interpretation of China’s President Xi Jinping statement regarding the “militarization” of the features. The original quote in Chinese was translated into English as “Relevant construction activities that China are (sic) undertaking in the island of South (sic)–Nansha (Spratly) Islands do not target or impact any country, and China does not intend [emphasis added] to pursue militarization.” That is considerably more ambiguous than Mr. Pham’s interpretation. Chinese spokespersons have since implied that if the U.S. continues its ISR probes, exercises, and Freedom of Navigation Operations challenging China’s claims there, China will prepare to defend itself. Given that the U.S. has continued these missions, it should come as no surprise that China has responded as it said it would. Based on false assumptions, Mr. Pham essentially recommends U.S. military confrontation of China in the South China Sea. Such confrontation could lead to war—on behalf of others’ disputed claims to ownership of tiny features and resources there. That would not be in the core national security interest of the U.S.
Mark J. Valencia is an Adjunct Senior Scholar at the National Institute for South China Sea Studies. This article is an adaptation of an academic publication by Bill Hayton published in ‘Modern China’ as ‘The Modern Origins of China’s South China Sea Claims: Maps, Misunderstandings, and the Maritime Geobody.’ A version of this article was published in Vietnamese by BBC and may be read here. The South China Sea is a dangerous place because of the layering of several different struggles on top of one another. There are struggles over the future of the world order, struggles between regional powers, and struggles over maritime resources. But underlying them all is a knot of territorial disputes over a few hundred tiny rocks and reefs. Given how much attention the disputes currently attract, it is surprising how little attention has been paid to their origins. A few flawed accounts were written several decades ago but more evidence has come to light since then and it is time to revise the conventional wisdom. Governments like to pretend that their claims to the hundreds of rocks and reefs in the sea are historical and logical. However, after several years of studying them, it is clear that this is far from true. The focus of most of the current trouble in the South China Sea is the Spratly Islands and a few underwater features that are closer to the coasts of Vietnam and Borneo. These are a very long way from the Chinese mainland and China has never made clear the precise origins of its claim to them. My own research – just published in the academic journal ‘Modern China’ – leads me to conclude that the Chinese claim only emerged because of some poor translation and bad map-making during the 1930s. My conclusion is that China’s claim to the Spratly Islands is actually a mistake. The story of China’s claims in the South China Sea began in 1907 with the discovery of a Japanese merchant digging up petrified bird droppings on the island of Pratas (between Hong Kong and Taiwan). Nishizawa Yoshiji was one of many Japanese entrepreneurs mining guano for fertilizer all over the Pacific. However, there were rumors that Japan was also planning to build a naval base on Pratas and that concerned the United States and its newly-acquired colony in the Philippines. The American government informed officials in Beijing in late 1907 but it took well over a year before a Chinese ship was sent to investigate. In March 1909, Chinese officials confirmed Nishizawa’s presence. That triggered large protests in southern China and a boycott of Japanese products. The Japanese government agreed to negotiations, which eventually led to Japan recognizing Chinese sovereignty over Pratas. 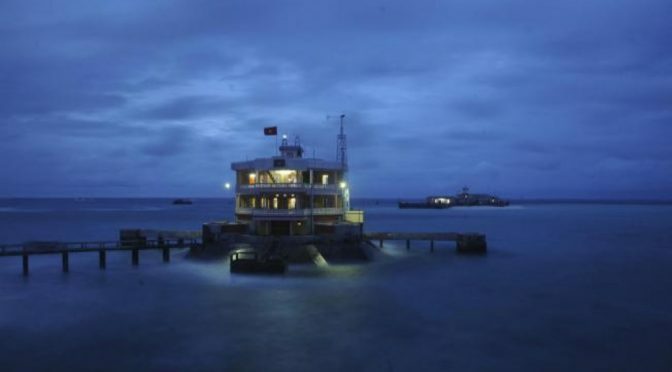 However, at the same time, the southern Chinese authorities learned about the existence of the Paracel Islands, apparently for the first time, and became concerned that Japan might try to annex them. This led to an expedition in May and June 1909 during which China formally claimed sovereignty over the Paracels for the first time. The Chinese ships spent three days among the islands firing cannon and planting flags before returning home. However, it was immediately clear to the expedition leaders that the Paracels were not going to deliver any riches. Newspaper accounts mention a plan to turn them into a penal colony but within weeks the authorities had completely lost interest in the islands. They did not return until the 1920s. The next major incident in the South China Sea created complete confusion – a muddle that infected the earlier academic accounts of the Chinese claim and still affects historical discussions to this day. In December 1931 France – the colonial power in Indochina – claimed sovereignty over the Paracel Islands and, nine months later, China protested. In July 1933, while the two governments were still arguing over the Paracels, France also announced the annexation of six of the Spratly Islands. This led to great confusion in China. It is clear from official documents and newspapers of the time that the Chinese authorities did not know the difference between the Spratlys and the Paracels. They thought that the islands that France had just annexed were the same that China had claimed in 1909. It took several weeks for the confusion to be cleared up. During the discussions the Chinese Navy even sent a telegram to the Chinese Foreign Ministry asserting that the Spratly Islands did not exist! The situation was only cleared up with the help of maps provided by American officials in Manila. In the end, the Chinese government decided that it could not prove a claim to the Spratlys and so did not protest against France’s actions. However, this confusion led the Chinese government to instruct its ‘Land and Water Maps Review Committee’ to investigate the situation. Among the committee’s other tasks, it inspected and translated maps to show which islands were the Paracels and which were the Spratlys. It also gave Chinese names to them – but these were simply translations or transliterations. North Danger Reef became Beixian 北險礁 (a translation from English). Spratly Island became Si-ba-la-tuo 斯巴拉脫島 (a transliteration of the name of the English sea captain, Richard Spratly), and Luconia Shoals was transliterated as Lu-kang-ni-a 盧康尼亞滩. My own research suggests that the list of names the committee translated was probably taken from the China Sea Directory, published in 1906 by the United Kingdom Hydrographic Office. However, in the process, the committee made some mistakes. It seems to have been particularly confused by the English nautical terms “bank” and “shoal.” Both mean an area of shallow sea—the former describes a raised area of seabed, the latter is a nautical expression derived from Old English meaning “shallow.” However, the committee chose to translate both as tan 灘, which has the ambiguous translation of “sandbank,” a feature that might be above or below water. The committee gave one particular underwater feature, James Shoal, the Chinese name Zengmu tan 曾姆滩, and another, Vanguard Bank, the name Qianwei tan 前衛滩. Zengmu is the transliteration of “James,” Qianwei is a translation of “vanguard,” and tan is the translation of “bank” and “shoal.” This translation choice has had major consequences, as we shall see. Why it decided to make a particular point of selecting these two underwater features for its list is also something of a mystery. My hypothesis is that, since they did not undertake any of their own hydrographic surveys, committee members were completely guided by the maps that they were copying. One map that would have been part of any standard collection at the time was one produced by Edward Stanford Ltd. of London. The company’s 1918 map entitled Asiatic Archipelago gives particular prominence to both James Shoal and Vanguard Bank and to most of the other features listed by the committee (see Figure 1). I suspect that this map also guided the committee’s choices about which features to give Chinese names to. Figure 1. 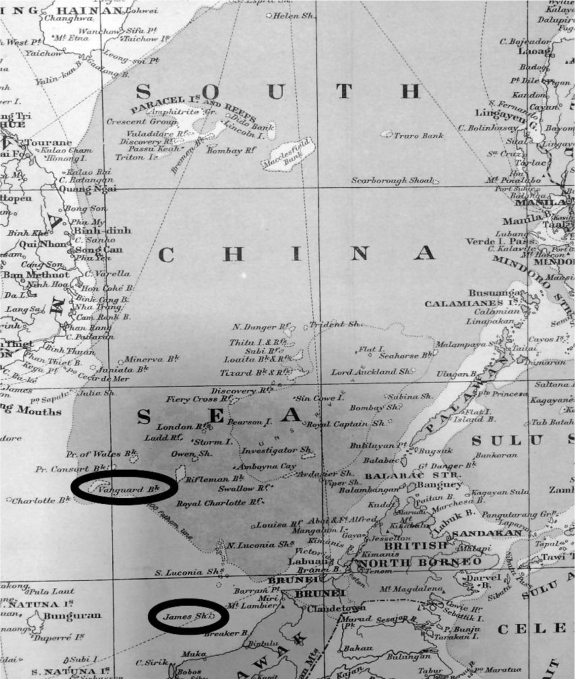 Asiatic Archipelago, showing James Shoal and Vanguard Bank as underwater features (circles added by author). Map published by Edward Stanford Ltd., London, 1918 (British Library shelfmark Maps 88715. In 1936, Bai Meichu 白眉初, a founder of the China Geography Society, used the committee’s information to publish his New Atlas of China’s Construction 中華建設新圖. Taking his cue from the committee’s mistranslation, he made a massive mistake. He drew the underwater James Shoal and Vanguard Bank as islands. 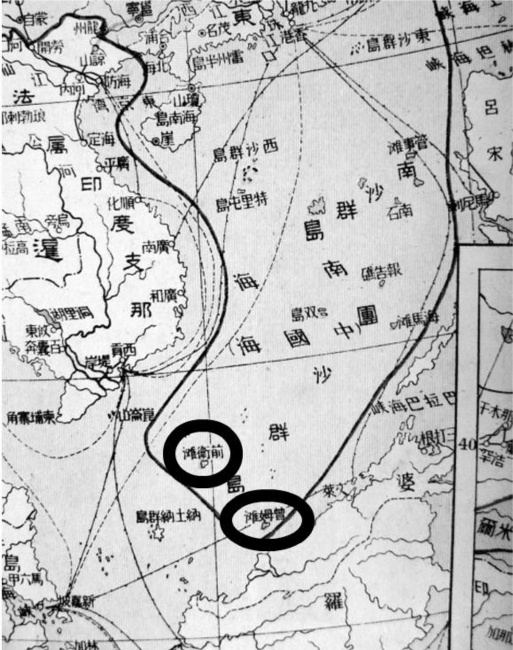 He then added a U-shaped line around the South China Sea as far south as James Shoal and as far southwest as Vanguard Bank (see Figure 2). Bai’s meaning was clear—the line marked his “scientific” understanding of China’s rightful territory. Because of his mistakes the James Shoal and Vanguard Bank would later became the limits of China’s claim in the South China Sea. This was the very first time that such a line had been drawn on a Chinese map. It was not a state document though; it was the work of a private individual. Figure 2. Map from New Atlas of China’s Construction (1936) published by Bai Meichu. James Shoal is labeled as Zengmu tan 曾姆滩, and Vanguard Bank as Qianwei tan 前衛滩. Both are drawn as islands with solid outlines and colored infill and are encompassed by the Bai’s boundary line. (Highlighting circles added by author) Source: Beijing Normal University Newspaper no. 295 (May 10, 2012), http://bnu.cuepa.cn/show_more.php?doc_id=613549. Bai added some other innovations, too. He also drew the underwater features of the Macclesfield Bank (in the center of the South China Sea) as islands. This may be the reason why, to this day, the Chinese state talks about four “archipelagos” in the sea, even though one of them demonstrably does not exist! This view of China’s maritime territory would change dramatically over the following three years. It seems likely that this change was facilitated, perhaps even orchestrated, by two of Bai Meichu’s students. In 1927, while he was chair of the Department of History and Geography at Beijing Normal University, Bai taught Fu Jiaojin 傅角今 and Zheng Ziyue 鄭資約. After the Second World War, they were hired by the Chinese Ministry of Interior to advise the government on its territorial boundaries. They drew the government maps in 1946 and 1947 that led to the official Chinese claim in the South China Sea. Fu and Zhang used Bai’s map and his ‘U-shaped line’ to guide them. Thus China would claim the underwater features of the James Shoal and Vanguard Bank as its territory. This makes no sense at all – except if you understand this strange piece of history. The Chinese claim is the result of a series of mistakes. In October 1947 the ROC Ministry of the Interior renamed the islands within its new claim. Most of the 1935 translations and transliterations were replaced by new, grand-sounding and more “Chinese” titles. For example, the Chinese name for Spratly Island was changed from Si-ba-la-tuo to Nanwei 南威島 (Noble South) and Scarborough Shoal was changed from Si-ka-ba-luo 斯卡巴洛礁 (the transliteration) to Minzhu jiao 民主礁 (Democracy Reef). Vanguard Bank’s Chinese name was changed from Qianwei tan to Wan’an tan 萬安灘 (Ten Thousand Peace Bank). This process was repeated across the archipelagos. The ministry seems to have recognized its earlier problem with translating “shoal” at this time because it coined the word ansha 暗沙, literally “hidden sand,” as a neologism to use instead of tan 灘 in the names of several features, including James Shoal, which was renamed Zengmu ansha. It was not until 1948, therefore, that the Chinese state formally extended its territorial claim in the South China Sea to the Spratly Islands, as far south as James Shoal. Clearly something had changed in the years between July 1933, when the Republic of China government was unaware that the Spratly Islands existed, and April 1947, when it could “reaffirm” that the southernmost point of its territory was James Shoal. Although the Chinese government likes to say that it has an ancient and historical claim to the reefs and rocks in the South China Sea, a detailed examination of evidence shows that it actually emerged in the first half of the twentieth century. It also changed during a 40-year period 1907-1947. The whole process was filled with confusion and misunderstanding. A few mistakes by a small number of poorly-informed Chinese officials and academics back in the 1930s have created lingering confusion that still poisons the politics of Southeast Asia to this day. Bill Hayton is an Associate Fellow with the Asia-Pacific Programme at Chatham House, the Royal Institute of International Affairs, London. He is the author of The South China Sea: The Struggle for Power in Asia and Vietnam:Rising Dragon. More Chinese assertiveness and unilateralism are coming. In January, this author’s article in a separate publication assessed strategic actions that Beijing will probably undertake in 2018; and forecasted that China will likely further expand its global power and influence through the ambitious Belt and Road Initiative (BRI), expansive military build-up and modernization, assertive foreign policy, and forceful public diplomacy. Recently, three worrying developments have emerged that oblige the United States to further challenge China to become a more responsible global stakeholder that contributes positively to the international system. Otherwise, passivity and acquiescence undermine the new U.S. National Security Strategy; reinforce Beijing’s growing belief that Washington is a declining power; and may further embolden China – a self-perceived rising power – to execute unchallenged and unhindered its strategic roadmap (grand strategy) for national rejuvenation (the Chinese Dream). On January 26, Beijing followed up last year’s policy paper “Vision for Maritime Cooperation Under the BRI” that outlined its ambitious plan to advance its developing global sea corridors (blue economic passages connected to the greater Belt and Road network) – with its first white paper on the Arctic. The white paper boldly proclaimed China’s strategic intent to actively partake in Arctic activities as a “near-Arctic state.” Activities include but are not limited to the development of Arctic shipping routes (Polar Silk Road); exploration for and exploitation of oil, gas, mineral, and other material resources; utilization and conservation of fisheries; and promotion of Arctic tourism. Beijing’s official policy positions on Antarctica are less clear and coherent, and appear to be still evolving. The closest sort of policy statement was made last year by China’s State Oceanic Administration when it issued a report (pseudo white paper) entitled “China’s Antarctic Activities (Antarctic Business in China).” The report detailed many of Beijing’s scientific activities in the southernmost continent, and vaguely outlined China’s Antarctic strategy and agenda with few specifics. All in all, Beijing doesn’t have a formal claim over Antarctic territory (and the Antarctic Treaty forbids any new claims), but nonetheless, China has incrementally expanded its presence and operations over the years. The Chinese government currently spends more than any other Antarctic state on new infrastructure such as bases, planes, and icebreakers. The expanding presence in Antarctica is embraced by Beijing as a way and means to build the necessary physical fundamentals for China’s Antarctic resource and governance rights. 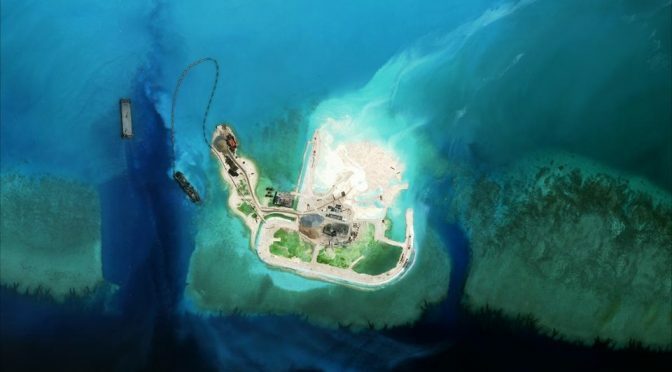 On February 5, released imagery of the Spratly archipelago suggests that China has almost completely transformed their seven occupied reefs – disputed by the other claimants – into substantial Chinese military outposts, in a bid to dominate the contested waters and despite a 2002 agreement with the Association of Southeast Asian Nations (ASEAN) not to change any geographic features in the SCS. At the same time, Beijing has softened the provocative edges of its aggressive militarization with generous pledges of investments to the other claimants and promising talks of an ASEAN framework for negotiating a code of conduct (CoC) for the management of contested claims in the strategic waterway. However, it is becoming increasingly apparent that China is determined to finish its militarization and then present the other claimants with a fait d’accompli before sitting down to negotiate the CoC. The photographs show that Beijing has developed 72 acres in the SCS in 2017 and over 3200 acres in the past four years; and redirected its efforts from dredging and reclaiming land to building infrastructure (airstrips, helipads, radar and communications facilities, control towers, hangars, etc.) necessary for future deployment of aircraft to project Chinese power across the shipping routes through which trillions of dollars of global trade flows each year. On February 8, China’s Ministry of Defense announced that it recently sent advanced Su-35 fighter aircraft to take part in a joint combat patrol over the SCS. At the end of the day, these latest images will not change Beijing’s agenda and plans for the SCS. They do however provide a revealing glimpse of what is happening now and what may happen in the near future on these disputed and contested geographic features (rocks and reefs) – and it sure does not look benign and benevolent as China claims. On January 17, USS Hopper (DDG-70) conducted a freedom of navigation operation (FONOP) during which it passed within 12nm of Scarborough Shoal. This was the fifth U.S. naval operation in the last six months to challenge China’s excessive maritime claims in the SCS. The Chinese media largely portrayed the operation as the latest in a series of recent U.S. actions intended to signal a new policy shift consistent with the new muscular U.S. National Security Strategy and U.S. National Defense Strategy and reflective of growing U.S. misgivings over China’s rise. The Chinese media is also increasingly depicting Beijing as having the upper hand in the SCS at the expense of rival Washington; and that U.S. FONOPs are now pointless since China has multiple options to effectively respond and there’s very little the United States can do about it. 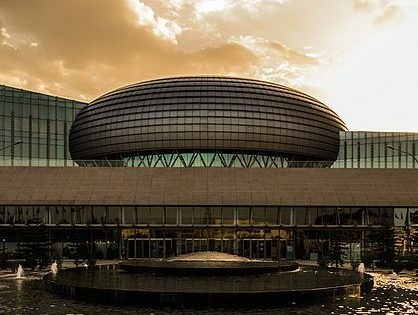 In late-January, African Union (AU) officials accused Beijing of electronically bugging its Chinese-built headquarters building, hacking the computer systems, downloading confidential information, and sending the data back to servers in China. A claim that Beijing vehemently denies, calling the investigative report by the Le Monde “ridiculous, preposterous, and groundless…intended to put pressure on relations between Beijing and the African continent.” The fact that the alleged hack remained undisclosed for a year after discovery and the AU publicly refuted the allegation as Western propaganda speaks to China’s dominant relationships with the African states. During an official visit to Beijing shortly after the report’s release, the Chairman of the AU Commission Moussa Faki Mahamat stated “AU is an international political organization that doesn’t process secret defense dossiers…AU is an administration and I don’t see what interest there is to China to offer up a building of this type and then to spy.” Not surprisingly, Fakit received assurances from his Chinese counterpart afterwards on five key areas of future AU-China cooperation – capacity building, infrastructure construction, peace and security, public health and disease prevention, and tourism and aviation. The suspected hack underscores the high risk that African nations take in allowing Chinese information technology companies such prominent roles in developing their nascent telecommunications backbones. The AU has since put new cybersecurity measures in place, and predictably declined Beijing’s offer to configure its new servers. Additionally, if the report is true, more than just the AU may have been compromised. Other government buildings were constructed by China throughout the African continent. Beijing signed lucrative contracts to build government buildings in Zimbabwe, Republic of Congo, Egypt, Malawi, Seychelles, Guinea-Bissau, Lesotho, and Sierra Leone. On January 23, President Xi Jinping presided over a Chinese Communist Party (CCP) leading group meeting to discuss how better to deepen the overall reform of the central government. He emphasized that 2018 will be the first year to implement the spirit of last year’s 19th National Party Congress and the 40th anniversary of China’s opening up to the West and integration into the global economy. The meeting reviewed and approved several resolutions (policy documents) to include the “Guiding Opinions on Promoting the Reform and Development of Confucius Institute.” The new policy synchronized the promotion of reform and development of the Confucius Institute; and directed both to focus on the “building of a powerful socialist country with Chinese characteristics, serving Beijing’s major powers diplomacy with Chinese characteristics, deepening the reform and innovation, improving the institutional mechanisms, optimizing the distribution structure, strengthening the building efforts, and improving the quality of education” – so as to let the latter (Confucius Institute) become an important force of communication between China and foreign countries. The seemingly benign and benevolent Confucius Institute is quite controversial, and is now receiving greater scrutiny within the various host countries for covertly influencing public opinions in advancement of Chinese national interests. In the United States, FBI Director Christopher Wray announced on February 23 that his agency is taking “investigative steps” regarding the Confucius Institutes, which operate at more than 100 American colleges and universities. These Chinese government-funded centers allegedly teach a whitewashed version of China, and serve as outposts of Beijing’s overseas intelligence network. On February 17, Xi issued a directive to cultivate greater support amongst the estimated 60 million-strong Chinese diaspora. He called for “closely uniting” with overseas Chinese in support of the Chinese Dream, as part of the greater efforts and activities of the United Front – a CCP organization designed to build broad-based domestic and international political coalitions to achieve party objectives. He stressed that “to realize the great rejuvenation of the Chinese nation, we must work together with our sons and daughters at home and abroad…It is an important task for the party and the state to unite the vast number of overseas Chinese and returned overseas Chinese and their families in the country and play their positive role in the great rejuvenation of the Chinese nation.” Ultimately, he hopes these overseas Chinese will collectively cooperate to counter political foes of the CCP, advance the party’s political agenda, and help realize broader Chinese geo-economic ambitions such as the BRI. The aforementioned troubling and destabilizing developments egregiously challenge the rules-based global order and U.S. global influence. Like China’s illegal seizure of Scarborough Shoal in 2012 and Beijing’s blatant disregard for the landmark ruling by the International Tribunal of the Permanent Court of Arbitration in 2016, they further erode the trust and confidence in the international rule of law (and norms) and undermine America’s traditional role as the guarantor of the global economy and provider of regional security, stability, and leadership. If the international community and the United States do not push back now, Beijing may become even more emboldened and accelerate the pace of its deliberate march toward regional and global preeminence unchallenged and unhindered. Tuan Pham has extensive experience in the Indo-Pacific, and is widely published in national security affairs and international relations. The views expressed therein are his own and do not reflect the official policy or position of the U.S. Government. This article originally was originally featured by the Centre on Asia and Globalisation and is republished with permission. Read it in its original form here. The ongoing disputes in the South China Sea (SCS) have been regarded as one of the most enduring and complicated regional conflicts in the Asia-Pacific. The disputes involve China along with several states in the region and encompass issues such as overlapping territorial claims and access to critical resources like energy and fisheries. Within this turbulent environment, India has been expanding its influence through implementing its Look East Policy (LEP). This has not been taken well by China, who has for years tried to curb New Delhi’s growing involvement in the SCS. India’s decision to involve itself in such a complex environment, even at the risk of provoking its giant neighbor, demonstrates the significance it places on the region and its sea lanes. The SCS is located in a region of great strategic interest for India. Geographically, it connects the Indian Ocean and the East China Sea via the Malacca Straits, which is one of the busiest sea lanes in the world. This important waterway serves as a vital economic artery for the South Asian state. Up to 97 percent of India’s total international trade volume is sea-borne, half of which, passes through the straits. In addition, the Association of Southeast Asian Nations (ASEAN) constitutes one of India’s largest trade partners, with total trade valued at $71 billion in 2016/2017. Energy is another component of India’s interest in the SCS. In 2015, India became the third largest oil consumer in the world, with industry experts predicting that its energy consumption would continue to grow by 4.2 percent annually. Already importing up to 80 percent of its total oil requirements, India will likely need to secure new energy sources as domestic demand rises. The potential energy deposits in the SCS have thus drawn New Delhi’s attention. In 2013, the U.S. Energy Information Administration (EIA) estimated the region to contain up to 11 billion barrels of oil and 190 trillion cubic feet of natural gas in reserves. As such, India has been continually involved in offshore energy development projects in the SCS since the early 1990s, bidding for new oil and gas blocks and conducting oil exploration in the region. The region’s economic importance translates into national security interests for New Delhi. With half of its maritime trade passing through the Malacca Straits, any instability in the SCS would adversely affect the shipping lanes and have a knock-on effect on India’s economy. Similarly, should a potentially hostile power come to control this region, it could threaten India’s access to this vital waterway. New Delhi’s involvement in the SCS thus, focuses on three objectives. First, to ensure peace and stability in the region and keep the vital sea lanes open; second, to maintain cordial relations with regional powers; and third, to ensure that no potentially aggressive external power comes to dominate the region. Through the LEP, New Delhi has pursued these objectives by seeking to intensify its engagement with ASEAN states. Besides increased economic engagement, strategic cooperation was expanded through joint naval exercises, generous lines of credit, military training, and sales of military hardware with regional states. 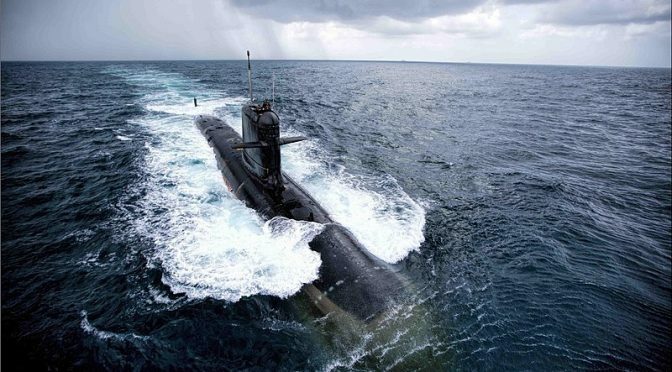 Moreover, the enhanced presence of Indian military assets in the area not only served to protect the sea lanes, but also provided ‘domain awareness’ of potential regional developments. Managing the region’s competing territorial disputes has required shrewd diplomatic awareness and delicate balancing from India. On one hand, the South Asian state wants to maintain friendly relations with the various SCS claimants; on the other, it has to avoid excessively provoking its Chinese neighbor. In New Delhi’s view, while activities such as energy exploration and weapon sales to the region would incur Beijing’s disapproval, such ventures are unlikely to instigate anything more than a verbal response from the Chinese. Taking a stand on the territorial disputes is another matter. China has repeatedly described the SCS as a “core interest”, indicating its willingness to use force to protect its claims. 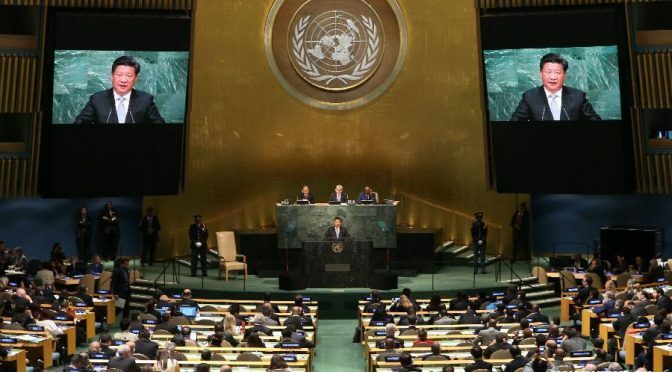 Thus, India’s stand on the issue has been one of deliberate ambiguity – not favoring any one side, but instead advocating freedom of navigation and peaceful resolution of disputes in accordance with international law, including the United Nations Convention on the Law of the Sea (UNCLOS). On the South China Sea Arbitration ruling in 2016, India, which had not taken sides in the dispute, urged all parties to respect and uphold the verdict of the UNCLOS-based tribunal. Recent developments in the SCS, however, have been a source of concern for New Delhi. China, which lays claim to 85 percent of the contested region, has been reclaiming and militarizing features in its possession. 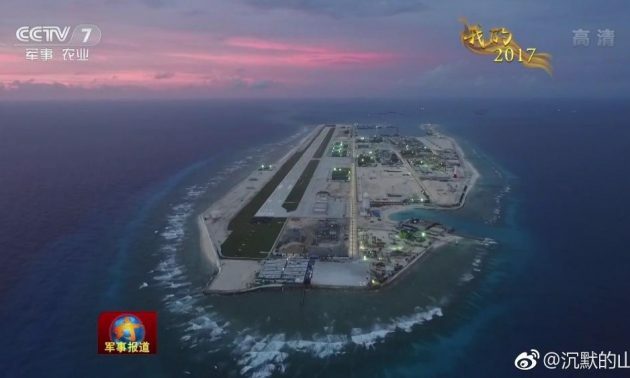 Between 2013 and 2016, China was reported to have reclaimed seven islands and built military installations including airfields, radar systems and missile bases on its reclaimed possessions in the area. Furthermore, Chinese vessels in the area have been known to act aggressively, harassing and intimidating vessels of other nations into steering clear of islands they claim. In response, other SCS claimants have also begun augmenting their deterrence capabilities on their islands with infrastructure such as coastal defenses, airfields and surveillance systems. Rather than peace, such actions have generated tension and destabilized the region. Even the United States (US), once a strong proponent for ‘freedom of navigation’ in the region, has been of little help to India. During his first year in office, President Trump failed to show any willingness to challenge Beijing over its behavior in the SCS. The new administration seemed to lack a clear policy towards the SCS, choosing to focus its attention instead on North Korea. More recently however, there are signs that change may be on the horizon. In late 2017, the once dormant Quadrilateral Security Dialogue – a defense partnership involving the U.S., Japan, India and Australia – made a sudden comeback, indicating the growing unease over China’s rise. The recently unveiled U.S. military strategy also indicates a shift in focus back towards China and Russia. While it is too early to tell how well this plan will be carried out under this administration, the U.S. is likely to seek closer ties with India as a counterweight to China’s regional dominance. Furthermore, it may also signal Washington’s renewed interest to check Beijing’s behavior in the SCS. What does the future hold for the SCS? New Delhi’s decision to recently host all ten ASEAN heads of state shows its intention to buckle down on its policy of strengthening ties with the region. Beijing’s policy in the SCS also seems unlikely to change. It has already swung the opinion of states like Malaysia and the Philippines, who have since softened their stances, and chosen to focus on cooperation with the Asian giant. With or without the U.S., India will have to continue to strengthen its ties with the region and play a part in managing its turbulent waters. Byron Chong is a Research Assistant at the Centre on Asia & Globalisation in the Lee Kuan Yew School of Public Policy. He graduated from the S. Rajaratnam School of International Studies with a Masters in Strategic Studies. His research interests focus on Sino-Indian relations and international security in Asia.